"Since beginning the whole eating challenge about a month ago, I have recently tried the crunchy almond butter. It is my absolute FAVORITE! I have yet to try another brand because I know I won't find the same quality, and from a 'local' town!! Using it for dipping apples or mixing with bananas and honey for a treat are among my favorite ways to use the almond butter! I have yet to try the cashew butter, but am sure it is just as delicious and of the same quality. Thank you for providing such a delicious wholesome product!" "I'm not gonna bs ya, this stuff is good. I've tried a lot of natural peanut butters, and most of them didn't suit me. This was very tasty." "I was recently in Michigan where I bought some East Wind Almond Butter at the Health Hut in Muskegon. It was delightful!" 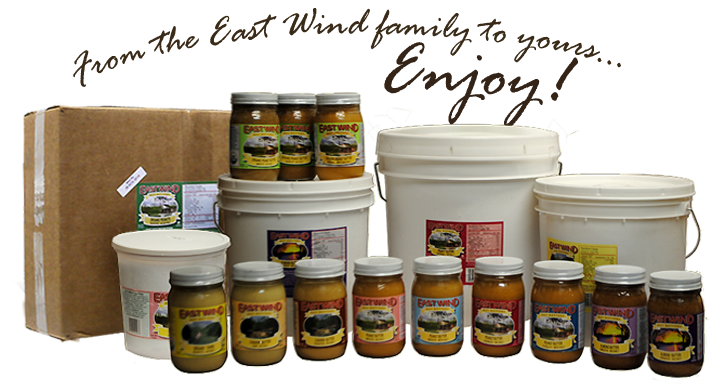 "East Wind Nut Butters simply has the best tasting nut butters around. Hands-down the best peanut butter...and believe me, we've tried lots! I own a chocolate shop and when developing a new peanut butter & chocolate product, we wanted to make sure we used the best tasting peanut butter we could find. We bought about 15 different peanut butters and tasted them all. We unanimously agreed that East Wind had, by far, the best tasting peanut butter. We found the same to be true for the almond butter. We are very happy with the superior quality and taste of East Wind Nut Butters and happily use them in our confections." 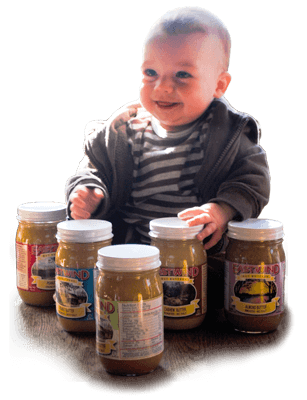 We have been making delicious, all natural nut butters since 1981! We take great pride in producing quality, wholesome natural and organic butters that are some of the best you will find, at the most reasonable price. Our products come in both grocery and bulk sizes. No sugar, corn syrup, preservatives, hydrogenated oils or other stabilizers are added. We carefully select high quality, non-GMO nuts and seeds. All of our products are gluten-free and certified Kosher. We produce peanut butter, both organic and non-organic, both crunchy and smooth, and both with and without salt. We also make crunchy and smooth almond butter, raw and roasted cashew butter and organic tahini. We package our butters in 35 lb buckets, 15 lb buckets, cases of 5 lb buckets (6 per case), and cases of 16 oz. jars (12 per case). We make roasted peanuts in 25 lb boxes. Unlike many of our competitors, we choose not to process our nut butter continuously. Instead, we carefully roast, mill, and package our butters in small batches. Why? Because with small batches, we produce fresh, hand-crafted, excellent tasting nut butter. Our nut butters are tried and true, simple and natural. We give you wholesome ingredients for a healthy life. None of our products were involved in recent FDA recalls. Please read East Wind Nut Butters' Quality Assurance Statement in reference to these recalls. Please hover over the photo below for product info, or see the table at the bottom of the page.